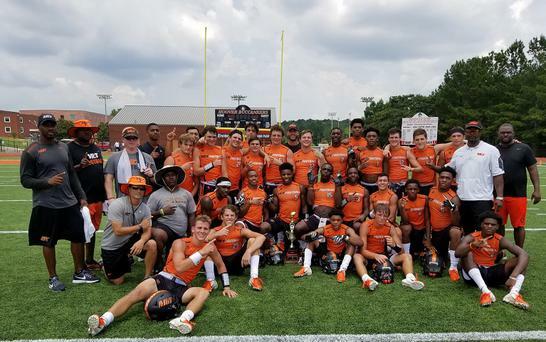 HOOVER, Alabama -- McGill-Toolen wins the Hoover City Elite 7 on 7 Championship in a three day competition that was held in Hoover, Alabama. McGill-Toolen went 7-1 in pool play but the #3 seed Yellow Jackets had wins over North Forsyth, Ga (25-16), Mallard Creek, NC (20-10), Colquitt County, Ga (18-12) and Spanish Fort (26-4) in the championship game. The only loss of the tournament was their opening game against Hazel Green before ripping off the next 10 wins. "We are learning how to compete that is why we are playing these kinds of tournaments," said McGill-Toolen head coach Earnest Hill. "We want to get better in the secondary, get better with our receivers running routes and our quarterback throwing the ball on time, but the biggest thing is just competing. That is how we win football games by competing and just out work everyone else. Memphis commit QB Sheldon Layman had a solid three days but the defense was the biggest consistent players in the tournament. The Yellow Jackets lost to Hoover in the Class 7A Championship game last season and is looking to get another chance at the 7A title. "This is our chance for our next guy to step up when we loose a few players off last years team," added Hill. "We lost three guys in the secondary so I was really proud the way they played up here. With a new offensive coordinator, our guys worked with Coach Scott for a month and kudos to our offensive staff for putting together a plan for our offense and winning this tournament." The defensive backs of Korian Wilson, Tyler Hansley, Joseph Langan, Sam Satterwhite and Joseph Williams were key in the McGill-Toolen win.